Usable ceramic teapot based on the Alice: Madness Returns game! Features exact details of the Level 2 Teapot wielded by Alice. Serves 6 cups and meets all FDA standards. 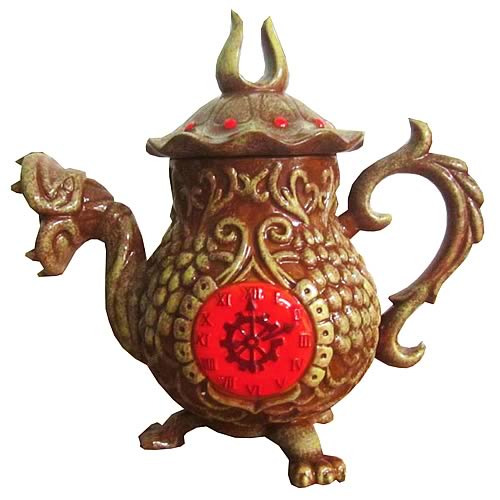 Epic Weapons, in collaboration with Electronic Arts, presents the Alice Madness Returns Replica Teapot. This ceramic teapot meets all FDA standards and can be utilized for serving tea to your guests! It's molded to the exact detail of the Level 2 Teapot wielded by Alice in the Alice: Madness Returns game and serves 6 cups. Ten years later, Alice madness returns as she endeavors to learn the secret that haunts her. From the various realms of Wonderland, Alice seeks answers. Undaunted by the diseased ambiance and mortal danger that surround her, Alice must press forward to understand why. Measures about 9 1/2-inches tall x 9 1/2-inches wide x 5-inches long.